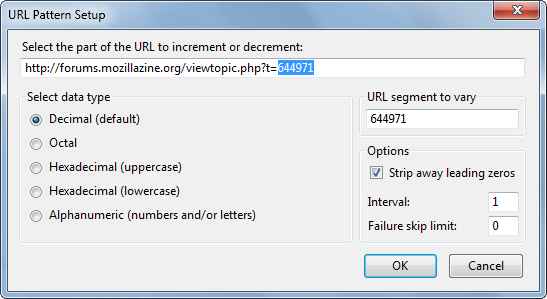 URL Flipper is a Firefox/SeaMonkey extension that allows you to easily increment or decrement a portion of a URL without having to manually edit the text in the Location Bar. 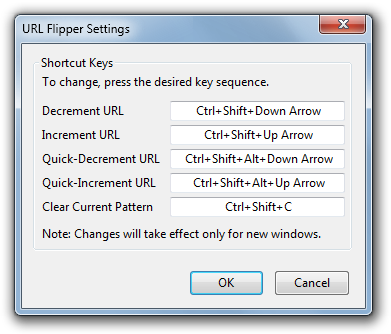 Once you have told URL Flipper which part of the URL you would like to change, you can flip through URL sequences with a single click of a toolbar button or press of a keyboard shortcut. It is very useful for navigating through image galleries, forum threads, etc. URL Flipper can be invoked with customizable keyboard shortcuts or with the click of a toolbar button. The usage guide details all of the ways to use URL Flipper and the shortcuts that users can use. And to reduce the number of times you have to see the pattern setup dialog, URL Flipper can also remember your URL patterns across browser sessions without compromising your privacy. URL Flipper has an option to seamlessly skip past bad URLs (those returning HTTP status codes 301-303, 403, 404, and 410), making it easier to get to the content that you are looking for. Additionally, URL Flipper will prevent redirects (i.e., HTTP 3xx and Refresh redirects) for pages that are loaded through URL Flipper (all other page loads are unaffected), so that your flow is not disrupted on sites that use redirects for errors. 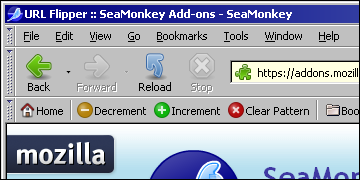 In addition to support for Firefox 1.5 and newer, URL Flipper is also compatible with SeaMonkey 2 and newer. URL Flipper supports incrementing and decrementing—with customizable interval sizes—decimal, hexadecimal, octal, and generic alphanumeric segments. If you would like to contribute a new translation or improve an existing translation, please visit URL Flipper's BabelZilla page.